The majority of my work involves commissioned pieces, however from time to time I create works for shows or sales or even just to try something out, and as a result have completed works available for purchase. This page shows a variety of items currently offered for sale, along with their price. Shipping is extra, and varies depending on the method of shipping and your location. Most of these items are also shown on other pages specific to the item, such as the Xmas Ornaments page, the Round Hardwood Boxes page, and the Jewellery page. They are gathered together here for convenience. 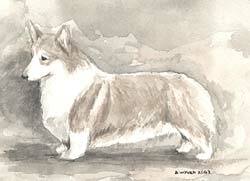 Additional items for sale can be seen on other pages, such as prints and cards available on the Art Prints & Cards page. I can accept payment by personal cheque, international money order, or Paypal. This pine clock measures 8" wide and 11" tall at the highest point. 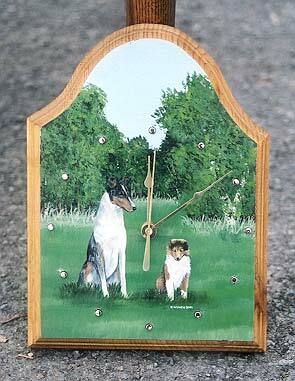 The wood was stained a rich warm brown and the painting on the face features a blue merle Smooth Collie sitting with a sable Rough Collie puppy in a summer scene. For more information on these and other ornaments, visit the Xmas Ornaments page. 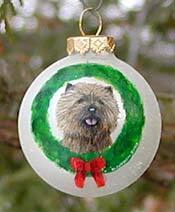 This is a lovely little glass ornament, with a charming Cairn Terrier looking through a festive Christmas wreath. The ornament is a soft white with flecks of brighter white, and measures 1 5/8" in diameter. This flat hardwood ornament measures 3" in diameter and is 1/4" thick. 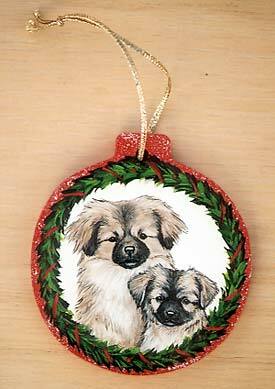 Both sides have been painted a bright Christmas red with white speckles, and one side features a lovely portrait of an adult Tibetan Spaniel with a charming Tibbie puppy, against a white background framed by a festive Christmas wreath. It hangs from a gold coloured cord. For more information on these items, visit the Round Hardwood Boxes page. 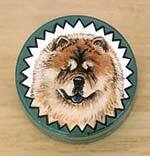 This small round hardwood box measures 1 1/2" in diameter and 1" high. 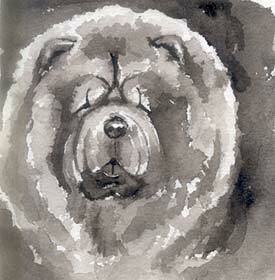 It has been painted light teal green (both inside and out) with a decorative black and white pattern around the side, and the lid features a handsome Chow Chow headstudy against a white background, and accented by a snazzy border. This round hardwood box measures 2 3/4" in diameter and 2 3/4" tall. It is painted, both inside and out, in a dark midnight blue and speckled with a combination of earth tones - raw sienna, burnt sienna, and terra cotta. 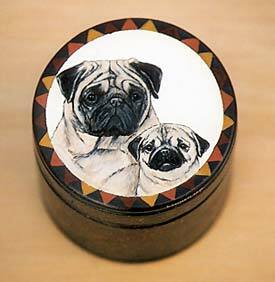 The same earth tones are painted in a geometric design around the lid to frame the portrait. 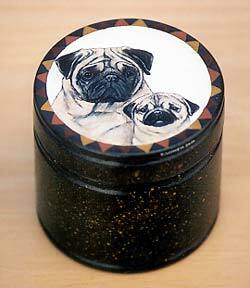 The lid features an adult Pug with a cheerful Pug puppy. These turned hardwood thimbles are painted all around with a continuous scene. The photo of each thimble shows 4 shots of each thimble turned slightly with each shot, to show the full design. These are actual 'thimble-size', measuring just 1 1/4" high, as seen in the photo of an unpainted thimble next to a ruler, shown at right. They are $35 each, plus shipping. These glass pendants are handmade by a local glass artist. 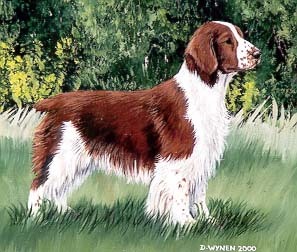 I paint on them using special paints which are baked in the oven for maximum durability. 18K gold plated or sterling silver plated bails are added. They come with a choice of black or natural 2mm waxed cotton cord. 16" is the standard necklace length, but longer or shorter lengths can be requested. They are $65 each. For more information on these, visit the Jewellery page. Sky blue pendant with standing Scottie. Silver bail, and black necklace. This pendant measures just over 1" high. Flecked brown pendant with fawn Pug headstudy. Gold bail, and natural necklace This pendant measures 1 1/8" high. These pins are hardwood and measure 2" long. 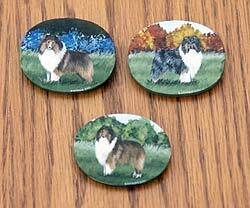 The Sheltie pin at the top left and the blue merle Collie pin at the top right have been sold. 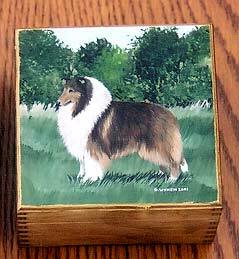 The sable Rough Collie pin in a summer scene at the bottom is available. 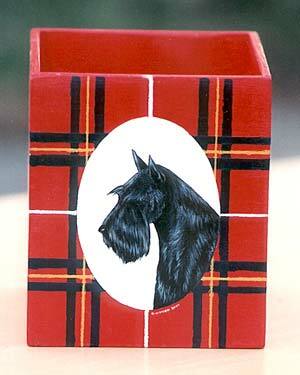 An original painting of a handsome Scottie against a white oval is featured on one side of this wooden pencil cup. 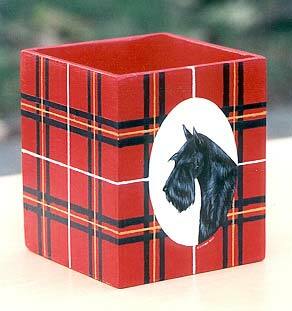 The background, on all 4 sides, is a vivid handpainted tartan pattern to perfectly complement this Scottish breed. The inside and bottom are solid red colour. The piece measures 3 3/4" x 3 3/4", and 4 1/2" tall. This box measures almost 4 7/8" x 4 7/8". 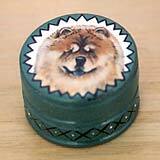 It has been stained a warm golden brown and features a scene on the lid with a sable Rough Collie in a summer scene. 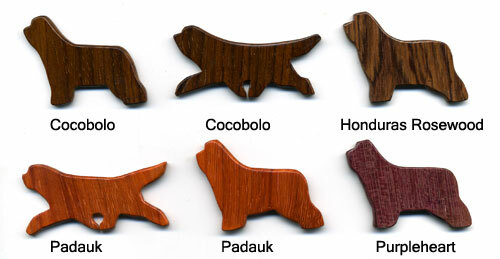 These are Bearded Collie pins, made from various exotic hardwoods. They were cut from 1/8" thick wood, sanded to an ultra smooth finish, and then waxed and buffed. The pin back was attached with a strong glue. The standing Beardies measure a little under 2" wide overall and 1 1/2" high, and the moving Beardies measure approx 2 1/4" wide and 1" high. The woods used for these pins are cocobolo, honduras rosewood, padauk, and purpleheart. Please note it is normal for some colour change to occur over time as the wood is exposed to sunlight, with most becoming slightly darker/browner. Pins are $35 each, plus $3 shipping within North America, or $6 for shipping Internationally. This is a large painting featuring four Bearded Collie pups running, against a black background. 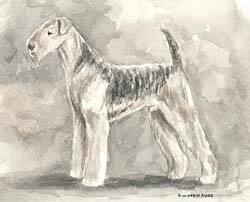 The pups represent the 4 Beardie colours - brown, blue, fawn, and black. 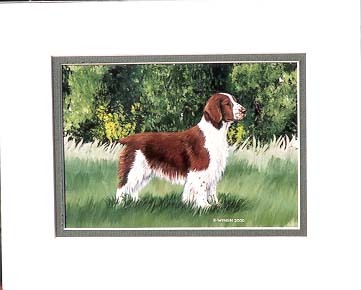 The panel is 'gallery style' with a depth of 1 1/2", and the sides are painted so the piece needs no framing. It comes ready to hang on the wall. This piece has received several coats of gloss varnish for protection.